When you login to the SBI net banking portal, it takes you to the Account Summary page where all your accounts are listed. This page lists all the Transaction accounts, Deposit Accounts, PPF accounts etc. The same set of accounts also appear in the merchant transaction page to choose one of them to complete the transaction. Hiding an account from this list may be useful in some cases so they never appear while doing payments through net banking. Though its not recommended to share password of Net Banking account, people do share it with family members or sometime with friends on need-on basis. In such situations hiding some accounts can be useful when you don't want to disclose all your status. At least I used to do it with my dad. Not sure if he used to do the same with me ;) The only way to see all these hidden account is when you know Profile password as well for the account. Profile password is always different from the login password. This display settings can be managed in Profile tab > Manage A/c Display. Enter your profile password, and it will take you to the Manage A/c Display page. This page have four tabs - Hide Accounts, UnHide Accounts, Hide Debit Accounts, UnHide Debit Accounts. Select all the accounts you would like to hide and submit the request. Note that if you hide accounts, you will not be able to view them in the debit and credit account list, when you perform a transaction. 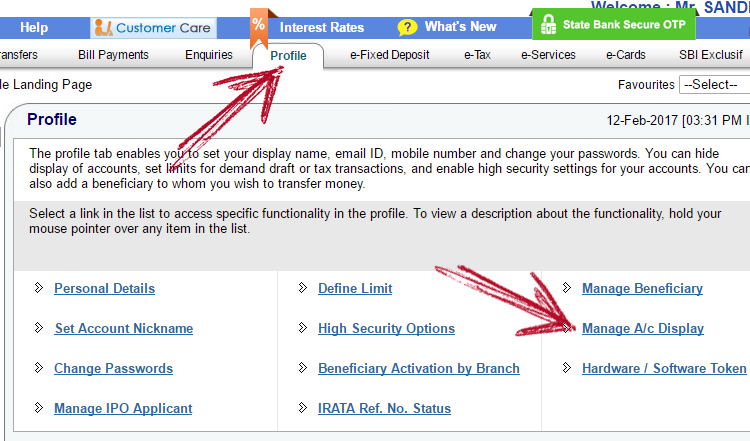 In addition, you cannot view these accounts in the Account Summary, Account Statement, Find Transactions, TDS Enquiry and Get Current Balance pages.